Feeding a crowd for the big game? These easy Cheesesteak Sandwiches will be the star of your menu. 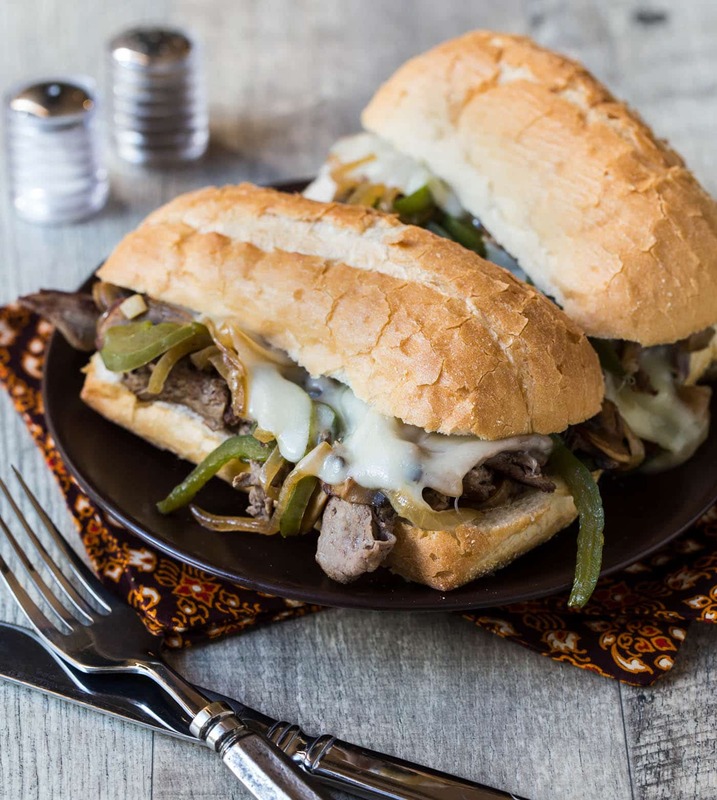 Though I’ve never been to Philadelphia, I think the city of brotherly love would give me a nod of approval for this recipe for Cheesesteak Sandwiches. While not 100% authentic (everyone has an opinion on what makes a good cheesesteak), these sandwiches come pretty close to the real deal. And they make an excellent addition to your game day menu. Hosting a bunch of hungry fans? 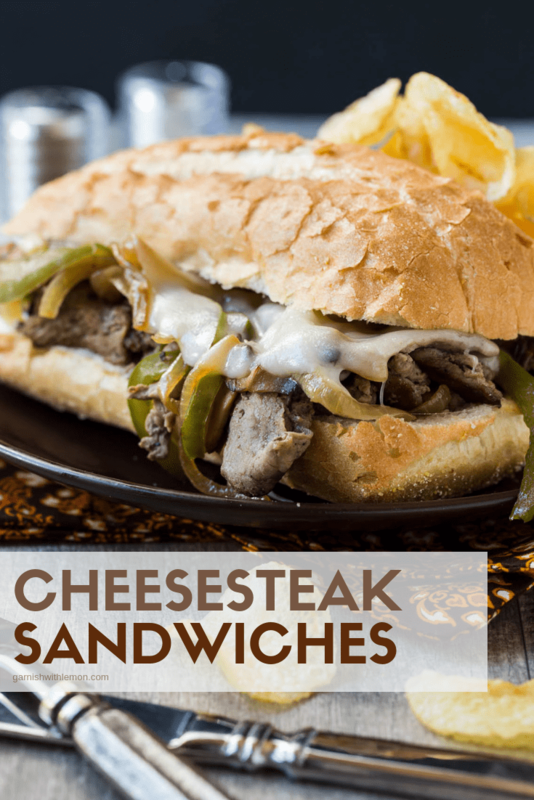 Below are a few suggestions to ensure your Cheesesteak Sandwiches come together easily before game time. Typically Cheesesteak Sandwiches are made with ribeye, but you don’t have to be a purist when it comes to the meat. I’ve made these successfully with ribeye, New York strip, top sirloin and skirt steak. Part of what makes a Cheesesteak special are the super thin slices of meat, so pop your meat in the freezer before you slice it. Slightly frozen meat cuts much easier than cold or room temp meat. You can prep a lot of this meal ahead of time. Do all of your slicing and chopping earlier in the day and store the fridge until you are ready to cook the sandwiches. The same goes for the garlic mayonnaise. Place a cover on top of your pan while you melt the cheese over the meat and veggie mixture. It will melt more quickly and evenly. Cheesesteaks are always messy. Embrace the imperfection. 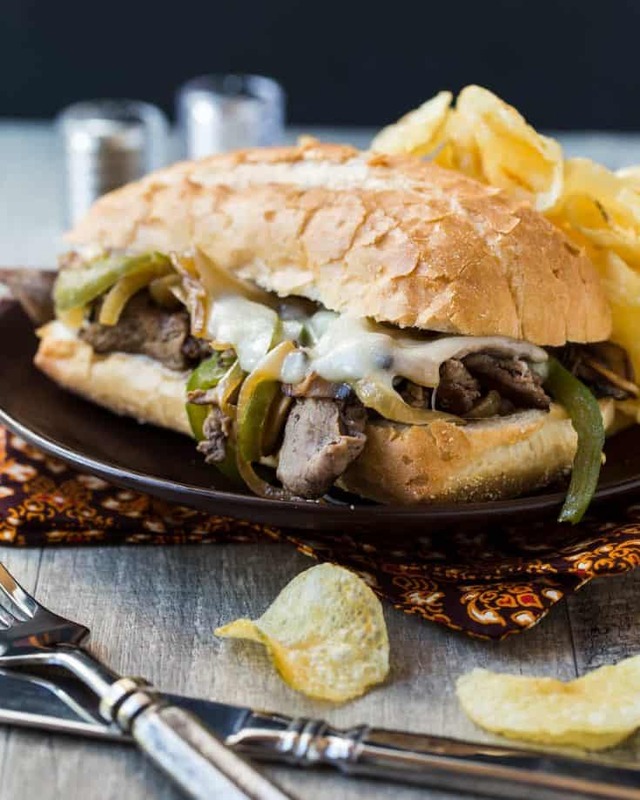 These easy Cheesesteak Sandwiches will be the star of your party! Combine garlic and mayonnaise in a small bowl. Spread mayonnaise on hoagie rolls. Set aside. Heat 1 tablespoon olive oil in an extra large skillet over medium heat. Add bell pepper, onions and mushrooms and cook until veggies are tender. Remove veggies from pan. Add additional tablespoon of oil to pan if needed. Add meat to pan and cook until just a hint of pink remains. Stir veggies back into pan with meat and season with salt and pepper. Top meat and veggie mixture with cheese. Cover pan and allow cheese to melt for 2 minutes. When cheese is melted, scoop portions of cheesesteak onto hoagie rolls using a thin spatula. You may not use all of the garlic mayo. It will keep in the fridge for a few weeks, so slather it on a sandwich for lunch. I can’t even deal with how much I want one of these right now. I might just scrap tonight’s dinner plans altogether to get these in my life sooner! Haha…it sounds like Bridget and I could be long lost sisters….when I’m really hungry, it’s not pretty. I don’t know how this happened, but I don’t think I’ve had a cheesesteak in almost 10 years….crazy! I’m swooning over all this melty cheese and peppers and mushrooms. This is getting adding to our dinner line up this week for sure! I hope you enjoy it, Kelli! It’s great comfort food, especially as the evenings start to get cooler. My kids could give or take the mushrooms, but that just means more for me! This is straight up #lunchhacks. So flavorful, simple and a delicious way to break the routine! The kids are gonna loooooove these!